Tomorrow photographer Mary Gardella and I are installing the winning design plan (plan #1!) into our client's living room. I can't wait to show you the "after" pictures. 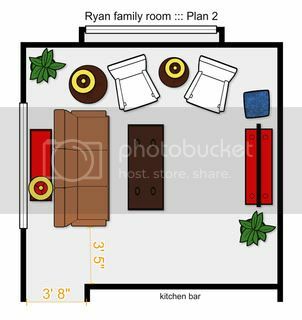 Here's the plan, the wall and sneak peek at the room's new design. Check back later this week for "after" pictures! We've been working on this living room transformation for several months now and tomorrow it will come together with the final installation. I can't wait to share it with you. I enjoyed another day on the TV set yesterday. I love that this "set" is a house that is under renovation (click here to read about my TV pilot gig) because I get to participate in a transformation and be on film. Very cool. Yesterday I was filmed working on a top-secret project for the show (don't worry, when the show is wrapped I'll share details). The project was an idea I presented during my final audition. As with many ideas, until you execute it, you never quite know how good it will be! Luckily this one worked out just as I envisioned, which is good because it unfolded on film. I look forward to sharing it with you. The most challenging part of the day was being filmed talking to the camera (with 5 people watching!) and giving the "audience" a design tip. Lots of smiling, talking slow and a little powder on my face to cut the "shine" and we got the shots! I didn't have a script, so it was a collaborative, wing-it process. Everyone really goes out of their way to make you feel comfortable and do your best. Finally, I did a voice over (reading from a script without the camera) for them to run over my craft project footage. That was done in the sound booth, also known as the mini van! We needed a quite spot and that was it. Reading like you aren't reading takes some skill, but I pulled it off. My other job on the show is behind the scenes selection of materials for the bathroom and kitchen renovations. I can't give those details away, but a lot of decisions, including paint colors, were made and this house and show are on their way to a great look! There are so many people involved in putting this pilot together. The producers, team (contractor, Realtor and host), sound, lighting and camera people are all very professional, funny, kind and interesting. It's been so much fun spending time with them on this project. Thanks for sharing the experience with me. I'll keep you posted; we're scheduled to wrap-up in mid-August. Happy decorating! Where has the month gone? As July comes to an end, I have exciting news to share with you. Last week I began working on a home renovation TV pilot! I'm used to my design work being on the other side of the camera, but not me. One cool thing about running your own business is you experience a lot of "firsts." First client, first big job, first referral, first moment in print...but I never really thought about having my first audition to be on television. I found out about the project through a client, who referred me to the producers. After a meeting at the house, a written proposal and an audition in front of the camera, I found out I was selected to be the designer for the pilot. Pretty cool, huh? Here's the skinny. The "untitled home renovation show" is filming in Towson, MD in a house that's being renovated for the project. I am one of a cast of 4, including a contractor, Realtor and a host. I don't know the name of the show, but if I did I probably couldn't tell you anyway! I filmed two scenes last week, one was shot in a small bathroom with 4 other people (three of them, the camera and lighting crew, were in the shower and to be ignored) and the other was shot around a table where the cast discussed the project. This show, like all home reality shows, has a twist, but I cannot tell you those details! The entire cast and crew are very nice and I enjoyed spending the day watching them work and chatting about life. It's fun to be part of a big project and I love learning about other people's jobs and talents. I'm also doing the design work for the show -- helping select the materials and finishing details for the rooms we're renovating. 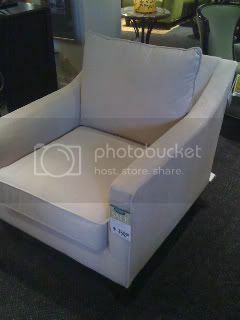 I had a great day shopping with the producers last week to find selections for the rooms. There's more to come and I'll keep you posted! Send happy camera vibes my way. Thank you to everyone who voted in our second wall design challenge. The client thought about this one for a while, but finally selected plan #1. Judy is the lucky winner of the blog contest (congratulations, Judy! ), now I just need your contact information. Please email me with your mailing address so I can send you your stationary pack. We are ordering these box frames for installation in early August. Stay tuned -- the entire design challenge project is due to be featured in the October issue of Howard magazine. How exciting. Thanks again and happy decorating! Design challenge #2 - vote to win! I'm excited to share my second "design challenge" collaboration with photographer Mary Gardella of Love Life Images. I'll explain the project, show you the design plans and then you can comment and vote on your favorite plan. Everyone who votes for the client's selected plan will be entered into a drawing to win a beautiful stationary set! Mary came up with the idea for the design challenge when she discovered that many of her clients were stumped after their photo shoots—they didn't know what photos to select or how to best display them in their homes, so they sometimes did nothing. They were stuck and needed help. Mary and I brainstormed how we could add value to her clients by offering a design consult in their homes to help them decide where to hang their pictures. 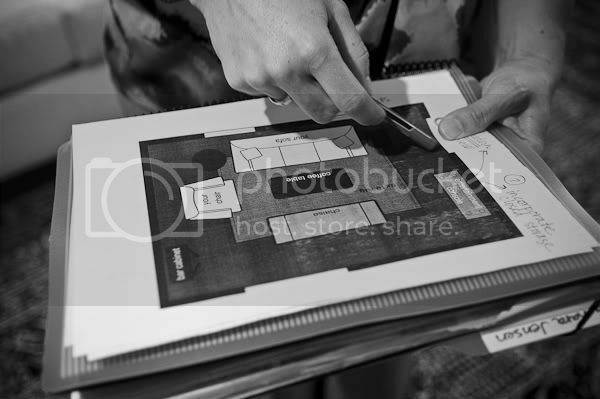 It helps clients decide what size pictures to order and ultimately gives them a detailed plan for displaying them. For our second design challenge, Mary and I are working with a shared client, Tamara Jensen. I've been working on design projects in Tamara's home for the last year and a half and Mary has taken photos of her family, so she became our perfect design challenge #2! Tamara is now redesigning her living room so we decided a wall design was in order for this room. During the consultation, we discussed that Tamara wanted clean lines for her design. She wants the living room to be calm. Next we looked through the photos and picked Tamara's favorites. 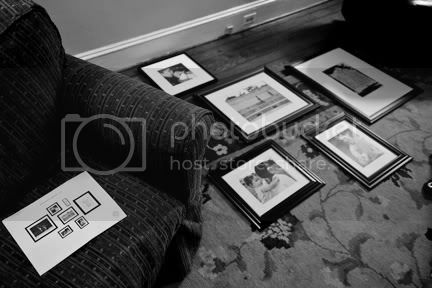 We decided to use box frame with black and white images of the family. Box frames are similar to canvas wrapped frames, but made out of wood with black sides. Stunning! 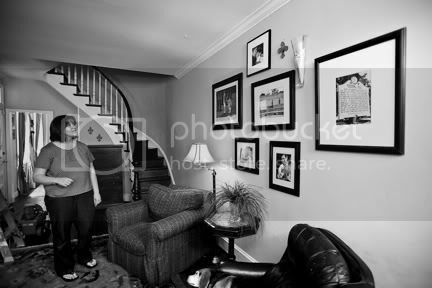 Once home, I began creating symmetrical plans to fit the wall using the photos Tamara loved. Below are the 3 plans we presented to Tamara. Please leave a comment with your vote for your favorite. Voting ends Tues., June 29 at noon. The winning plan will be announced here and I will select a name at random from those of you who select the same plan as Tamara. To be entered to win a lovely set of stationary please comment and include your name, a way to contact you and the plan # you are voting for. Come on, I know you like to share your opinion so please let me know what you think! Voting ends at noon tomorrow, June 29. I'll announce the winning plan, select a winner & contact that winner over the next few days! Spread the word about this fun project via email and facebook! Design challenge #1 - completed! Did you know that there are people out there who don't hang photos or art on their walls because they are afraid to do it wrong, or they just don't know where to begin? You know someone like that, right? Maybe you are one of those people and if so, you'll love this post! 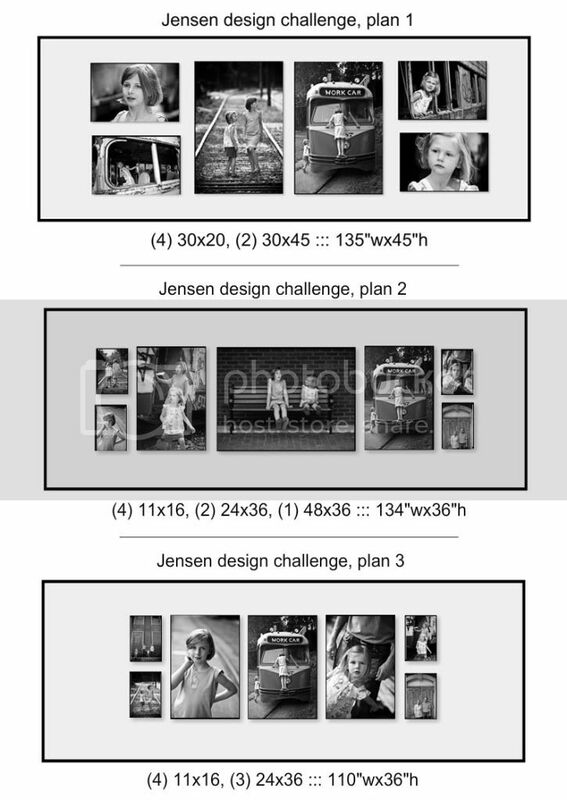 I recently completed the first design challenge with Mary Gardella, photographer with Love Life Images. What is the design challenge? It's a project Mary came up with to help her clients create great photo displays after their photo session with her. It helps people get un-stuck! Mary brought me in to meet the client, see her home and work with them to select the photos and design a wall display for those great pictures. Then, we brought in Kathy Nevin, owner of Handy Ma'ams (great company name, right?) 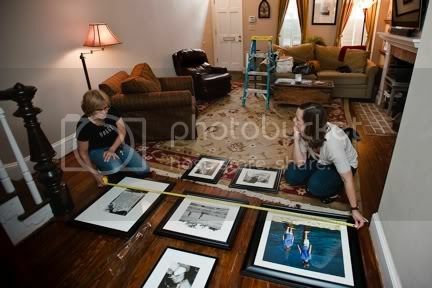 to do the photo installation in the client's home. The results? Wonderful! I put together this little video to show you how it all came together! If you want to go back and see how the design challenge all began, check out the contest that kicked it all off. If you live in the Baltimore Metro area and want a photo shoot with Mary and design challenge in your home, contact me or Mary! 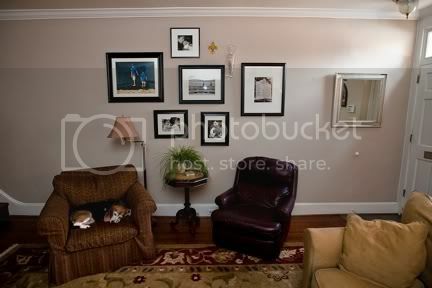 I am working with a client in Catonsville, MD to redecorate her family room. She's artistic, has a great eye and has many treasures she wants to better display. This family of 5 wants to make over their family room for optimal chill time. It's a lovely, light-filled room and is painted a burnt sienna color. 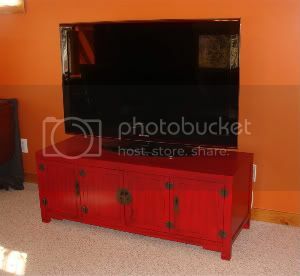 They have a red television cabinet that is staying and everything else is being updated. We began the design with a space plan so we could see what pieces worked best in the room. The focus is on viewing the television. Next it was time to shop for a new sofa and chairs to fit the plans and family. Comfort is key, but style is a close second. We found this chair at Shofer's Furniture in Federal Hill. The client also selected a leather sofa with clean lines (I don't have a good picture of that, sorry, you'll have to wait for the "after" pictures to see that!) and a storage ottoman and we then found fabrics to tie all of the pieces together. Check them out! Now we have to wait a few months for the furniture to come in, but we'll be hanging art on the walls, shopping for pillows and bringing in window treatments to finalize the room so we'll be all set when the furniture arrives. Stay tuned. 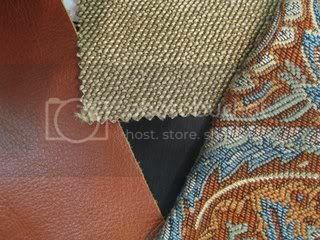 If you are bringing in new furnishings think outside the box - leather doesn't have to be dark brown (not that there's anything wrong with that! 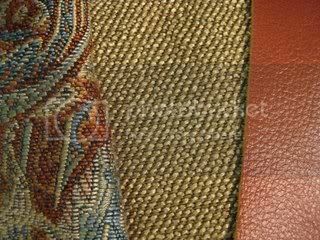 ), ottomans don't have to match your sofa and you can do a bold fabric -- the key is tying it all together by color pallet and style.